B U B B L E G A R M: Kiehl's Washable Cleansing Milk Review! 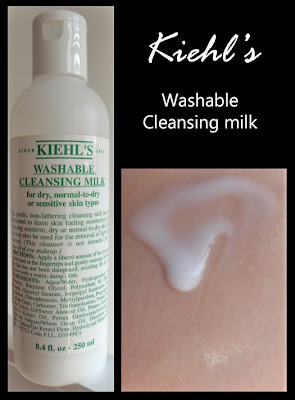 Kiehl's Washable Cleansing Milk Review! For dry, normal - to - dry or sensitive skin types. What it is: A non lathering gentle cleansing milk that can be used to wash your face, or applied on a cotton round to remove light facial makeup. It can also be massaged into facial skin that has not been dampened and removed with a warm, damp cloth. I love multifunctional products, and this one ticks all the boxes, previously I used a face wash by Neal's Yard and a cleanser by L'occitane which are equally as effective. But, why have two products when one does the job? Great for travelling! I have been using this product for a while now and have to say that I am really extatic with it. My skin is looking better than ever and i'm wearing less makeup throughout the day. Usually i'm quite sceptical about trying new products as my skin breaks out really easily but, this hasn't broken me out at all. The texture of this is quite runny and I quite like the smell of it too. The only downside to this product is that I wish it had a pump applicator as sometimes I can squeeze too much out. Word of warning: What works for me doesn't neccassarily mean it will work for you! Thank you for the great review! I will definitely check this one out.